On this day in 1923, Paul V. Hadley was executed for murder in Arizona. His story, however, actually begins on March 20, 1916, when Paul Hadley and his wife Ida Lee — fugitives from Beaumont, Texas on an assault with intent to commit murder charge — were taken into custody in Kansas City, Missouri. He was running a movie theater by then, living under an alias. Sheriff Giles had known the Hadleys for years. He trusted them and didn’t bother to search Ida, and at some point during the ride he removed Paul’s handcuffs. He paid for his negligence with his life: just before the train entered Checotah, Oklahoma, Ida retrieved a gun she’d hidden in the women’s toilet and shot the sheriff in the back of the head. He died within minutes, leaving nine children orphaned. Paul took the dead man’s gun and used it to persuade the engine driver to stop the train. He and Ida jumped off and disappeared. 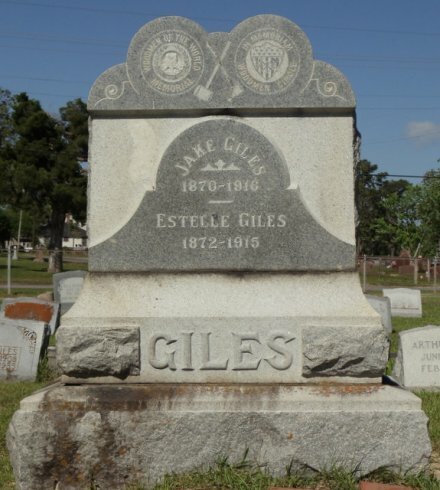 The pair were arrested by a posse the next day, however, and charged with Sheriff Giles’s murder. Ida was judged insane, but she wanted to share her husband’s fate and insisted on pleading guilty to a conspiracy charge, so she got sent to prison for ten years rather than to a mental hospital. Paul was sentenced to life in prison. He appealed his conviction, but the verdict was upheld in 1918. But Paul found another way to get out of the pen: in 1919, he persuaded the state of Oklahoma to furlough him for a sixty-day period. Accounts vary as to the reason why; it may have been so he could visit his dying mother, or it may have been because he’d invented some gadget and needed to find investors for it. Either way, it seems that, as long as he pinky-swore he would come back, the prison authorities had no trouble granting a leave to a cop-killer with a history of escaping from custody. You’ll be shocked to hear that Paul Hadley didn’t turn up for re-incarceration. By the time the police went looking for him, the trail was two months’ cold. Hadley was gone. By November 1921, he was going by the name William S. Estaever and hitchhiking his way west. In Denver, Colorado he got picked up by an elderly married couple named Peter and Anna Johnson, who were driving to California. Southwest of Tucson, Arizona, Hadley pulled a gun on Peter Johnson and forced him to pull over. He ordered the couple out of the car and shot them, killing Anna instantly and seriously wounding her husband. Leaving Peter for dead on the roadside, Hadley took their car and drove on. The vehicle broke down, however, and as he was hoofing it to Yuma, Arizona, he was arrested. He was still carrying the murder weapon, a .32 caliber Mauser pistol. One A.J. Eddy matched the Mauser with bullets taken from the victims’ bodies and shell casings found in their car. The defense moved to strike his testimony on the grounds that Eddy was “not an expert.” He was a lawyer by trade and his research into the area of bullet identification was only as a sideline. The judge decided, however, to grant Eddy “semi-expert” status: good enough to present his evidence in court. Hadley claimed he and the Johnsons had been attacked by a gang of bandits and he had returned their fire, but Peter Johnson recovered from his injuries and testified against him at the trial. The first jury was unable to reach a verdict. Hadley was convicted after a second trial, however, and sentenced to death. 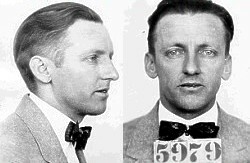 It was only then that authorities realized the criminal William Estaever was the fugitive from Oklahoma Paul Hadley. Estaever/Hadley’s conviction was appealed all the way up to the Arizona Supreme Court, with his appeals attorney arguing Eddy’s testimony should never been allowed into evidence. The court upheld the conviction, however, in a historic ruling: this was the first time a state supreme court had recognized ballistics evidence as valid and admissible. The day before his death, Hadley was baptized by the Reverend J.W. Henderson and the prison doctor, James Hunter, who was a former minister. Dr. Hunter remained with Hadley the whole night and the condemned man slept fitfully and spent a long time praying and singing hymns. He refused a final meal early that morning and calmly walked to the scaffold after the warden read the death warrant at 5:00 a.m.
His last words were, “I am innocent and ready to meet my death.” The trap sprung at 5:10 and Hadley pronounced dead five minutes later. Nobody claimed the body and so it was deposited in the prison cemetery. As for Ida Hadley: Paul never tried to get in touch with her in the two years of his extended release from prison in Oklahoma. She remained his dutiful wife, however, and when she found out he had been convicted of murder in Arizona and sentenced to death, she begged the Oklahoma governor to pardon her so she could be with him in his last days. She got her pardon on July 22, 1922 and went immediately to her husband’s side so she could help with his appeal. A week after Paul’s execution, the widow Hadley married Jack Daugherty of Wichita Falls, Texas. She enjoyed her second marriage for less than a year, however: Ida Lee Hadley Daugherty died on March 21, 1924.